Farm, History -- Muscoot Farm Complex - Are We There Yet? Operated by the Westchester County Dept. 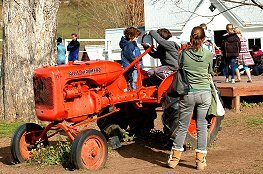 of Parks, Recreation and Conservation, Muscoot is an Interpretive Farm where visitors can discover what farm life was like in the 1920's. The farm originally ran a herd of 60 dairy cows, marketing the milk in New York City. Family and children's group day trips feature many attractions which are educational, fun, and charming. Just to mention a few, the Visitor Center/Carriage House provides a reception area and farm education center; the Activities Building, once home to the carriage horses, now houses a variety of workshops and programs for families and groups (call for a very full calendar); the Blacksmith's Shop was an absolute essential to a farm, and this one was used by a blacksmith named Jasper Booth during the early 1900s; the Chicken House is just that, with its occupants ruled by the dominant chicken in accordance with the "pecking order"; and the Brooder House, where newborn chicks are raised. All the other animals that belong on a farm are at Muscoot. 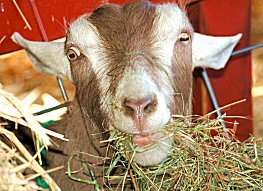 Ducks, geese, cows, horses, pigs, sheep, and goats live in their 1920's farm settings. They all seem quite happy with the attention they receive from the kids and adults who are thrilled to see them. Hours: Open daily, 10am - 4pm. Open most holidays, but call to be sure. General Public FREE. Family Workshops range in cost from $5.00 to $85.00. Call for the current fee for the Young Farmers Summer Program for children entering grades 1 through 8. This popular program fills up quickly and is available for Westchester residents only by a lottery drawn at the beginning of each year. See the official website, linked above, or call for details. Groups: farmyard visit by reservation. Fee based on size of group. Group Reservations: At least 2 weeks in advance. Groups with reservations welcome Wednesday through Friday. Directions: I-87 North to I-287 East to I-684 to exit 6. Turn left onto Rt. 35. Continue west to Rt. 100. Turn left onto 100 and proceed 1½ miles to entrance on right. 1 hour, 15 minutes from the George Washington Bridge.